Born Staten Island, New York, 1968; Admitted to bar, 1995, Illinois. Education: University of Illinois, Bradley University (B.S., 1991), Widener University School of Law, Wilmington, DE (J.D., 1995). Originally from the East Coast, Katrina M. Taraska grew up in a family of seven in Peoria, Illinois. Her mother was a language teacher proficient in French, Italian and Spanish who devoted her time to the enrichment of the lives of her students while teaching at area schools. Her father, a dedicated pathologist, was one of the four original founders of the Midwest affiliate of St. Jude Children’s Hospital, which provides care to children with childhood diseases. Unique to Ms. Taraska’s chosen career in personal injury law, she was the victim of a propane gas explosion, in which a commercial building collapsed on her, her mother, brother and a close family friend. The explosion left Taraska with extensive second and third degree burns early in her life. She was hospitalized for 3 months, during which she underwent skin grafting of her arms, legs, hands, and chest. Incredibly, a year prior to the explosion, Ms. Taraska’s father and a reconstructive surgeon opened the only downstate burn unit in Peoria where she was successfully treated despite the severity of her burns. It is this life changing event that has played a significant role in Ms. Taraska’s career of representing the injured. After graduating from law school and over the past 20 years, Ms. Taraska has successfully represented clients and their families in complex litigation. In 1995, Katrina Taraska began practicing law in downstate Illinois where she grew up. In 2000 she became a partner with a Peoria law firm where she enjoyed the privilege of advocating for her clients in their respective claims for personal injuries, medical negligence, workers compensation, and employment discrimination. She frequently appeared before the Circuit Court of Peoria County, Illinois, the Illinois Department of Human Rights, the Equal Employment Opportunity Commission, the Social Security Administration, the Department of Employment Security, and in the United States District Court for the Central District of Illinois. In 2009, Ms. Taraska joined the Chicago law firm of Goldberg & Goldberg, where she continued her professional experience as a Plaintiff’s lawyer in tort litigation. 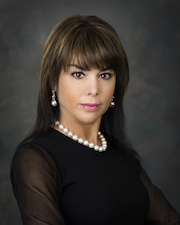 As a focus of her practice, she concentrates on representing individuals and their families in catastrophic medical malpractice and wrongful death claims. Her cases have involved spinal cord injuries, brain injuries, complications from surgical procedures, cardiovascular injuries, products liability, interventional radiology, infections, negligence in the diagnosis and treatment of injuries involving alleged abuse and neglect, as well as gynecological and obstetric injuries. Ms. Taraska also represents individuals involved in transportation accidents (railroad grade crossings, motor vehicle accidents, and semi-truck collisions), as well as premises liability claims, and injuries from assault, battery and false imprisonment. Throughout her career Ms. Taraska has been active in professional organizations including the Peoria County Bar Association, the Illinois Trial Lawyers Association, the American Inns of Court (Abraham Lincoln Chapter), the National Employment Lawyers Association, and the Chicago Bar Association. She has been guest writer for the Peoria Woman Magazine and enjoys mentoring younger lawyers in their professional endeavors. Ms. Taraska lives in Utica, Illinois with her husband and daughter. She and her family are members of St. Mary's Catholic Church and are active in the service of those individuals in need in the local community. $13,800,000.00 Verdict, Cook County. Verdict reduced by 10% for contributory negligence. Lead trial counsel in a wrongful death motor vehicle accident case against the City of Chicago. $10,000,000.00 Settlement, Cook County. Co-counsel at trial involving pedestrian semi-trailer truck case. $7,500,000.00 Settlement downstate, IL. Co-counsel at trial of medical malpractice case involving postoperative paralysis of patient. $7,500,000.00 Settlement downstate, IL. Pre-trial settlement of medical malpractice case involving failure to maintain spine precautions resulting in paralysis of patent. $1,250,000.00 Settlement, Cook County. Pre-trial settlement of medical malpractice case involving postoperative ischemia and infection of breasts following breast reduction. $800,000.00 Settlement downstate IL. Pre-trial settlement of medical malpractice case involving failure to timely diagnose DVT/Pulmonary embolism. $500,000.00 Settlement downstate IL. Co-counsel at trial of medical malpractice case involving a failure to timely diagnose infection of the elbow joint."